I’m fascinated by the strangeness of the Museum of Classical Archaeology. On one level it’s the unease at being watched over in our mortality by all those lowering gods and emperors, like being entombed prematurely in a great sepulchre. Then there is the dichotomy between the beauty of the sculpture and bloody, rapine, incestuous, vindictive, vengeful, greedy (etc., take your pick) stories they embody. Or partially embody – this is a world of headless, legless, armless, neutered sculptural carnage. 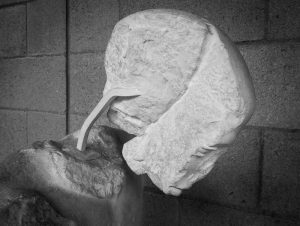 Nothing seems stranger than this head, reduced to the fragment of a face struggling to escape, Alien-like, from a block of stone. Photo: Head, Museum of Classical Archaeology, Cambridge, June 2018. That is one weird sculpture. Ancient art transmogrified into modern art. I’m pleased you like it, Dave. Definitely a weird one.